Are you planning to visit Scotland? Then I have good news for you: The country is nothing short of amazing. Wild landscapes, amazing wildlife, epic castles and the most delicious seafood you ever taste. There is just one problem if you want to call it a problem. 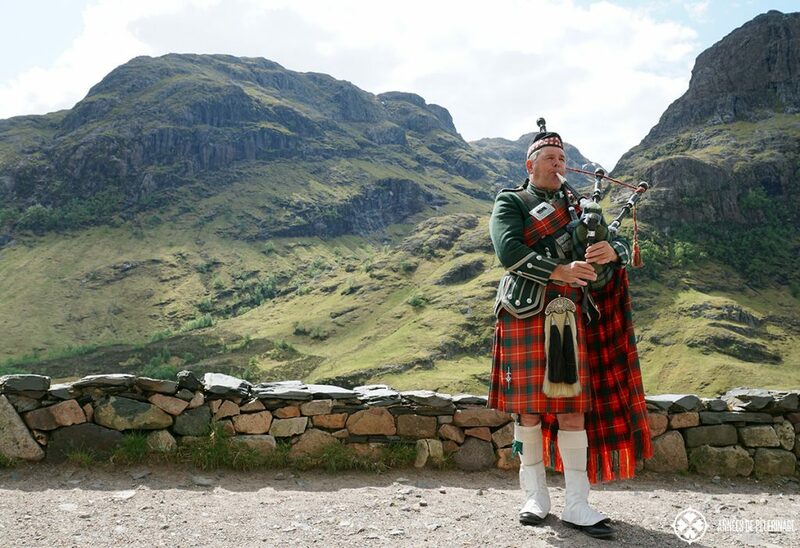 There are just so many things to do in Scotland that squeezing it all into one itinerary seems almost impossible on limited time. Every journey has to start somewhere, and Edinburgh might just be the best place. The capital of Scotland is a true must-visit. There is history, shopping, food, and many historic highlights. Do visit the Edinburgh castle, see the Palace of Holyrood house (where the Queen resides when she is in town) and certainly walk the Royal Mile. At the beginning of August, there will be the Edinburgh Military Tattoo, you might want to check out. 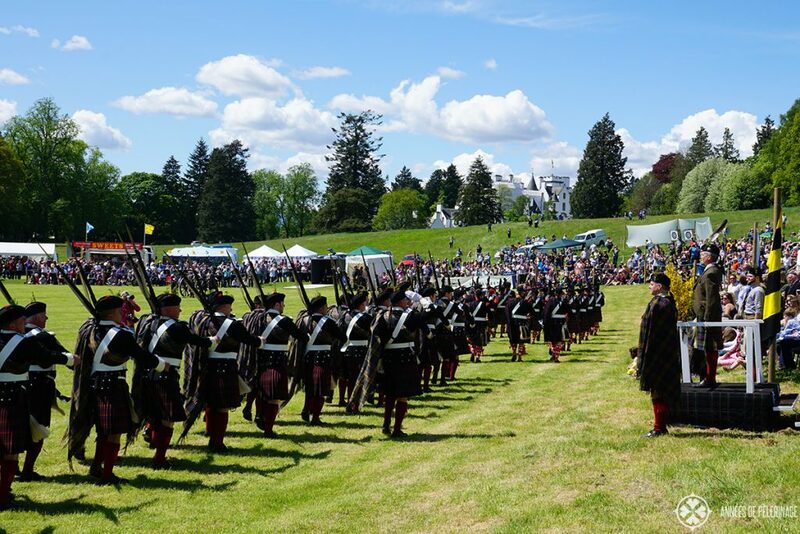 But there are certainly a lot of other festivals to enjoy in Scotland’s second largest city. If chance is not on your side, then I do urge you to check out the many pubs to sample the Scottish beer and whiskey. Never a mistake! 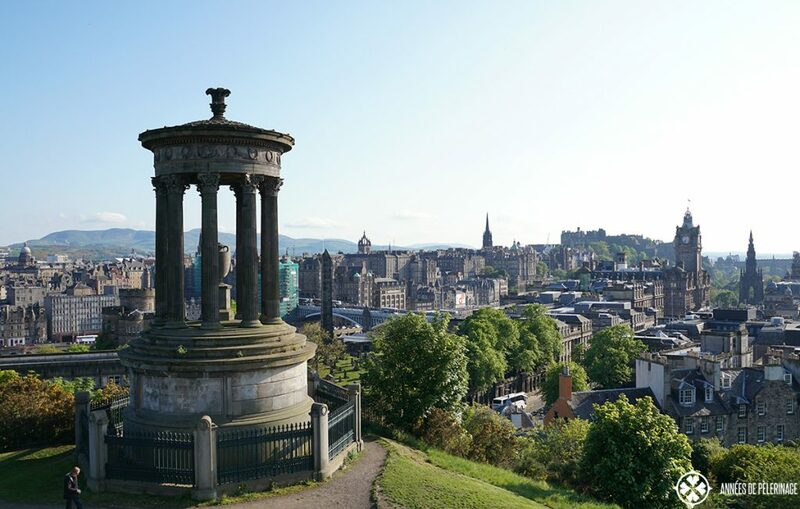 Pro tip: Walk the way up to Carlton Hill to enjoy the best view across Edinburgh. The most beautiful part of Scotland is arguably the Isle of Skye. Truly epic locations like the Neist Point, the Quiraing, Old Man of Storr and the Fairy Pools instantly come to my mind. It’s, in fact, so beautiful that it’s hard to do it justice with just one picture and a couple of lines. 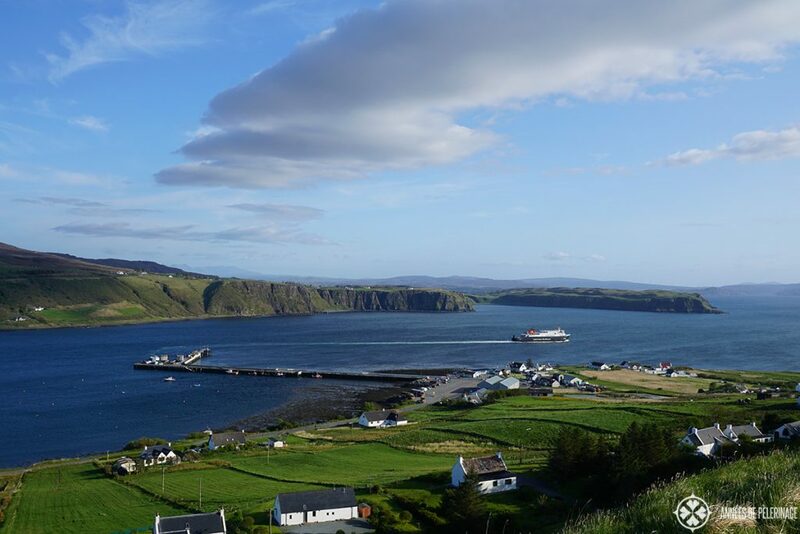 It’s easy to spend a week on the Isle of Skye itself, so I urge you to check out my article on things to do on the Isle of Skye. 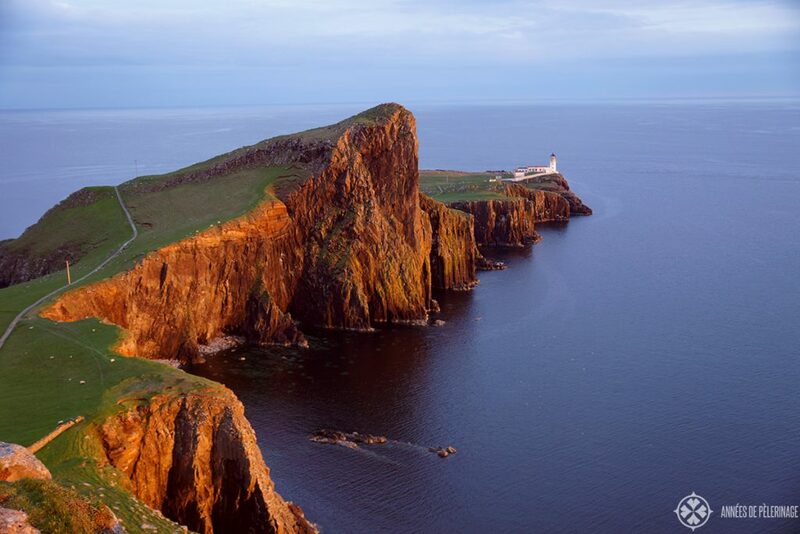 Pro tip: There are many other beautiful islands along the West Coast of Scotland. I simply loved Mull and Rum. So, check these out as well. Some of them, like Islay, sport some fantastic sandy beaches. Just remember to read my Scotland packing list, as it may be a bit harder to source important items of daily need on these. Scotland, you will soon notice, is all about the castles. 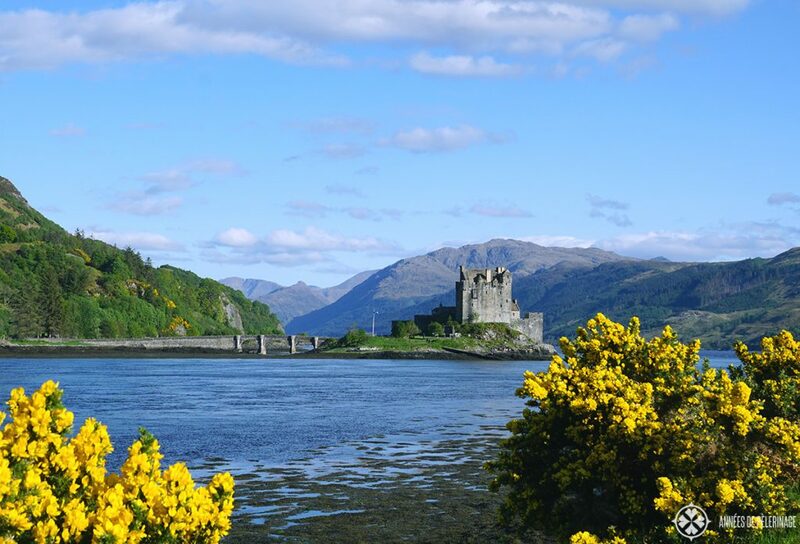 It’s hard to take a pick (which is why I wrote a list of the most beautiful castles in Scotland, you really should check out), but, to me, Eilean Donan is the one Castle in Scotland you have to see. It’s hard to capture with words, just how beautiful the whole setting is. Puffins might just be the cutest animals on this planet. 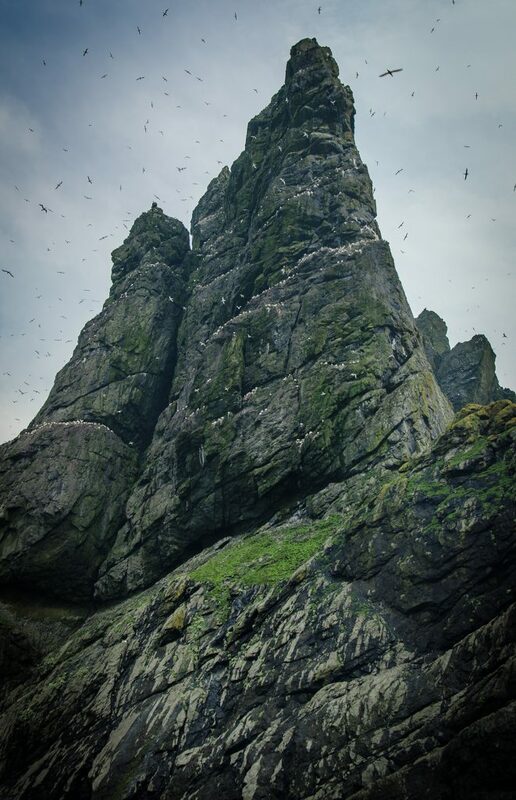 The very curious birds can be observed in many places in Scotland. 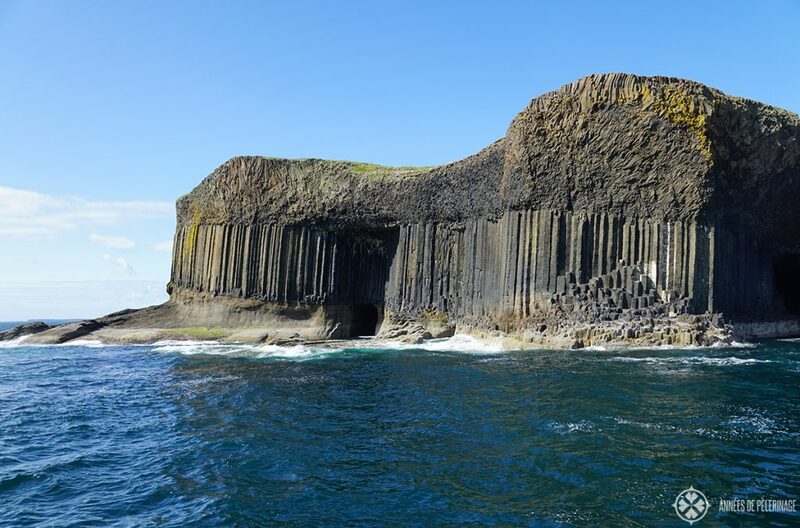 The very best place to see them is a very tiny Islands called Lunga. I wrote a full report on what to expect there. I’ll spoiler you a bit, though: 4.000 Puffins in one spot! 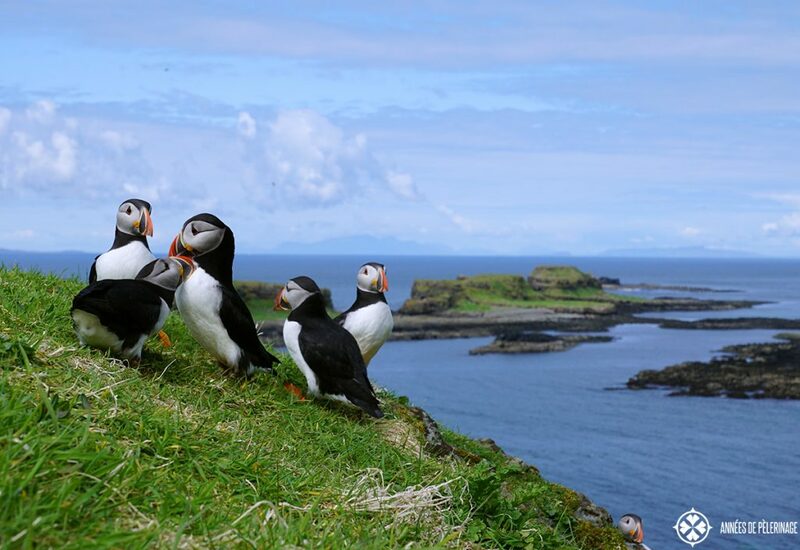 Important notice: Puffins can only be observed on land from mid-May to mid-August! Pro tip: Book your trip way in advance, as there are only a couple of tourist agencies offering this trip and tickets sell out fast. 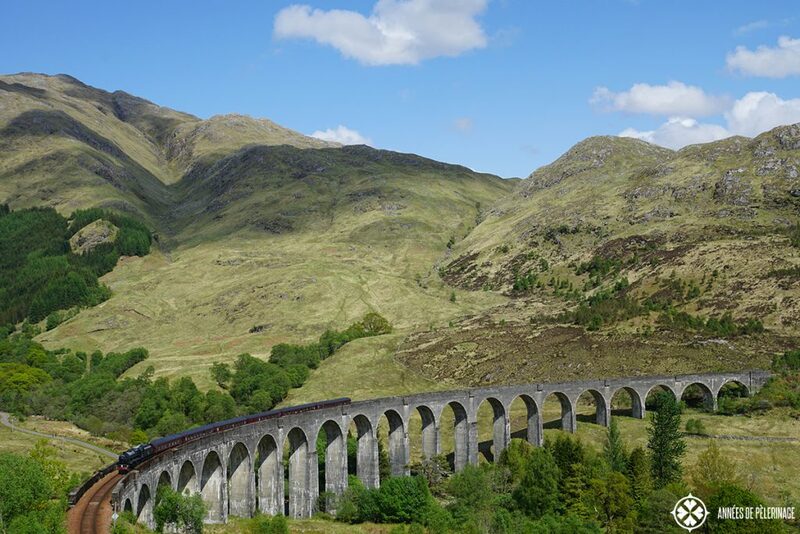 If you have seen one of the many Harry Potter movies, then the Glenfinnan viaduct will be a familiar sight. The famous viaduct can be found only a short drive away from Fort Williams and is totally worth a visit. Just make sure to check out the train schedule, so you will actually see the train passing by! Pro tip: Take the Jacobite Steam train from Glasgow to Oban to enjoy one of the most beautiful train rides in the world. Truth be told, there are virtually no ugly spots in Scotland – especially not on one of the rare sunny days in the highlands. But naturally you will not have the time to see every Glen and Loch, so you just will have to pick the ones that are a tiny bit more beautiful than the rest. One of these places is Glen Coe. Definitely, plan some time to hike along one of the many trails or visit the visitor’s center to learn a bit about the history and flora & fauna of Glen Coe. With all that nature around you, it’s quite easy to forget, that Scotland is also a place of innovation and industry. 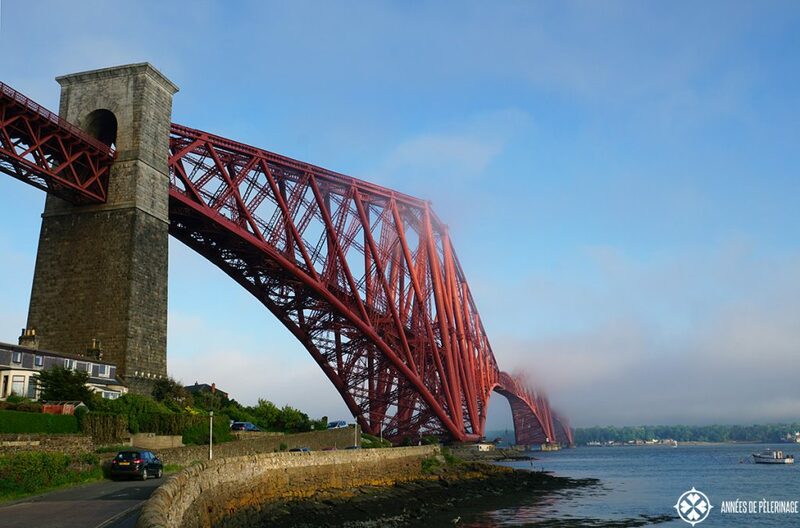 The Forth Bridge, now a UNESCO World Heritage site, is one such amazing things to see in Scotland. It’s a railway bridge dating back to 1890 and was the longest cantilever bridge at its time. Standing below it is quite intimidating! Never forget that Scotland is old. But just how old? 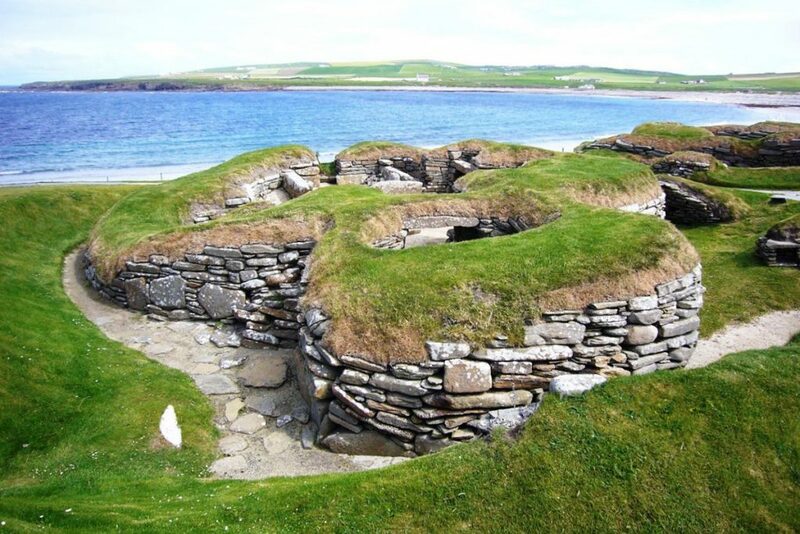 Skara Brae, on the Orkney Island called Mainland, is an impressive Neolithic settlement dating back to roughly 3,180 BC. It was inscribed a World Heritage site in 1999 and should be one of the many reasons for you to leave the Scottish mainland (small m!). Gylen Castle doesn’t appear on a lot of lists of things to do in Scotland. In fact, I personally haven’t seen it on any. That being said, it is my personal favorite spot in Scotland. 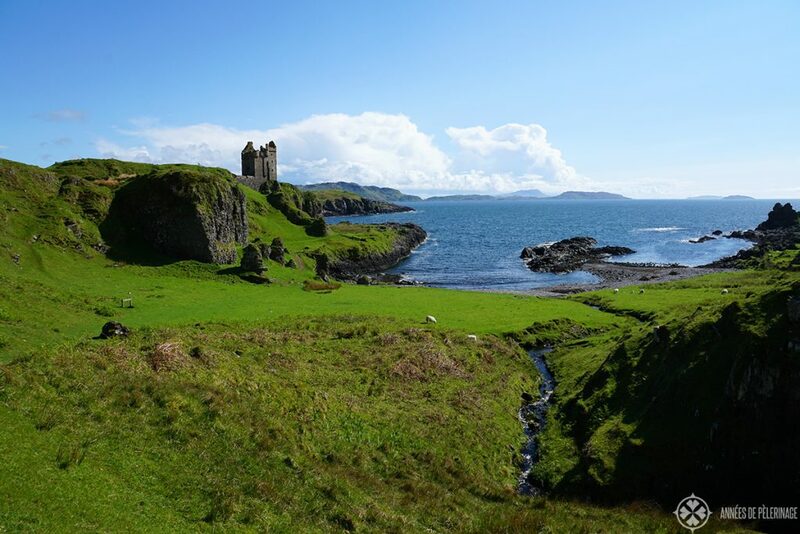 This hidden gem is located on a tiny island called Kerrerea, just a 5 minutes’ ferry ride away from Oban. Everything shouts picture perfect! I loved Stirling. The lay of the land, the food – it all just seemed like a fairy tale. 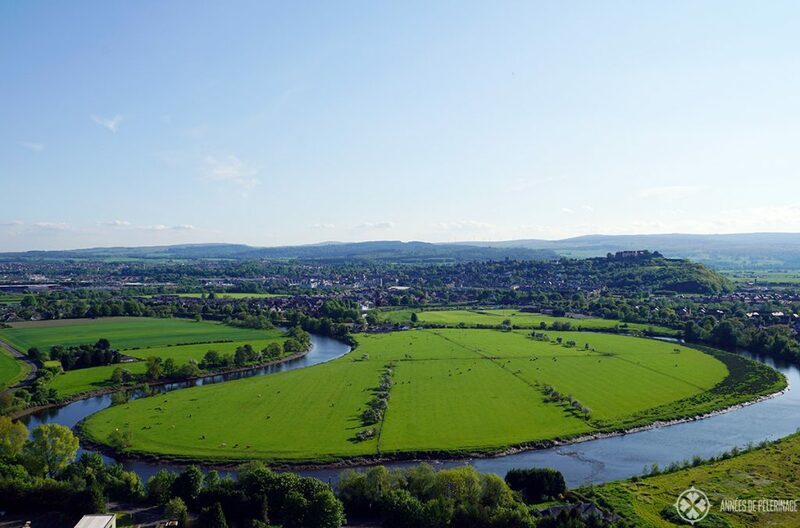 The best place to see the meandering u-turns of the River Forth is from the Wallace Monument. The monument is quite impressive in itself, but I enjoyed the view across the tranquil landscape the most! Stirling Castle is also a tourist attraction you do not want to miss as you travel through Scotland. Never head of Saint Kilda? It is one of the very few places on this planet to hold a double UNESCO World heritage status. In this case of its outstanding nature and the historic importance of the tiny island. 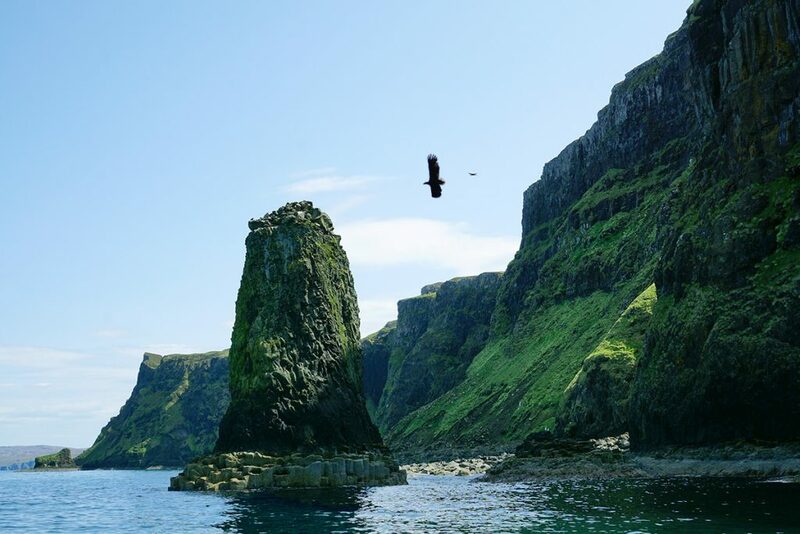 In the words of the UNESCO “it bears exceptional testimony to over two millennia of human occupation in extreme conditions” and “is unique in the very high bird densities that occur… with over 1 Million birds using the islands”. Do visit, even if it is quite far out in the ocean. PS: Remember to check the weather forecast and dress accordingly! 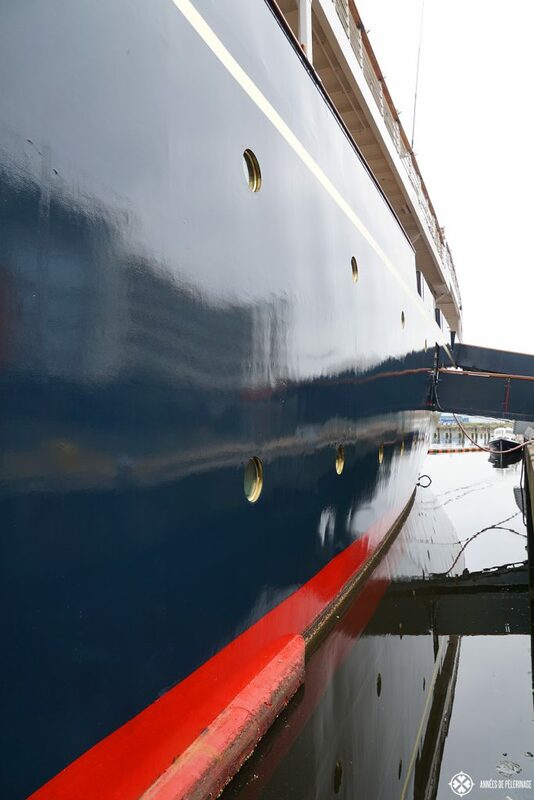 The Royal Yacht Britannia is one of the most iconic ships ever built. Queen Elizabeth II used it in between 1954 and 1997 to tour the world. A swimming palace, at that time, long before sheiks and Russian oligarchs decided to enter the contest. It is now permanently berthed in Leith, only a stone throw away from Edinburgh. Over 300.000 people visit this amazing piece of recent history a year, making it one of the most visited tourist attractions in Scotland. Here’s the official website, so you can plan your visit. Wondering about what to do in Scotland when it rains? Well, Scottish Whiskey, or Scotch, is famed throughout the world for its rich taste and many..let’s call them medical values. A bottle of single malt will make a fine souvenir. But do think beyond presents for your relatives and sample the “water of life” for yourself. The best place to do so is in one of the many distilleries. To tell you the truth, I was never a big fan of whiskey. But during the distillery tour, I was able to sample the many different blends and ages. Guess what? Now I love it! 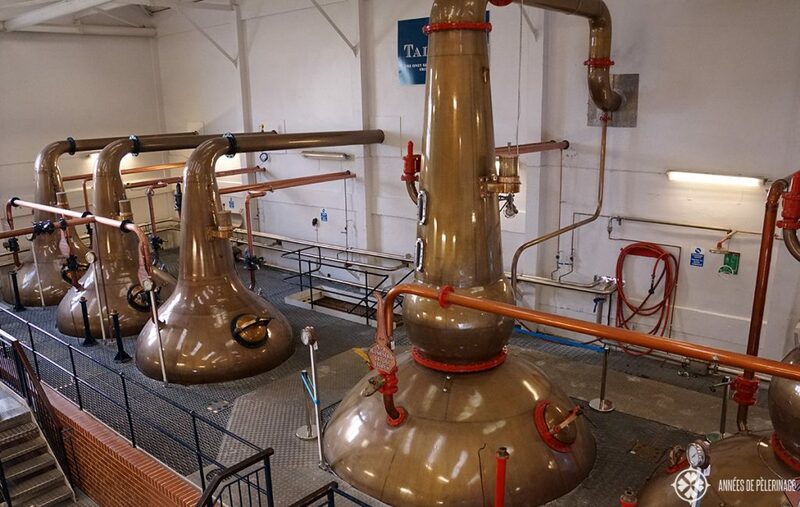 I do recommend you to visit one of the smaller distilleries, as they tend to be lest tourist infested. There are many beautiful cities and towns in Scotland. Glasgow, to be quite frank with you, doesn’t exactly belong to them. But Glasgow is an incredibly young city (with tons of students). There is lots of amazing street art to be seen and even a couple of excellent museums. So if you want to see the young & modern side of Scotland, this is probably the best place to visit (though Aberdeen is quite lovely as well!). 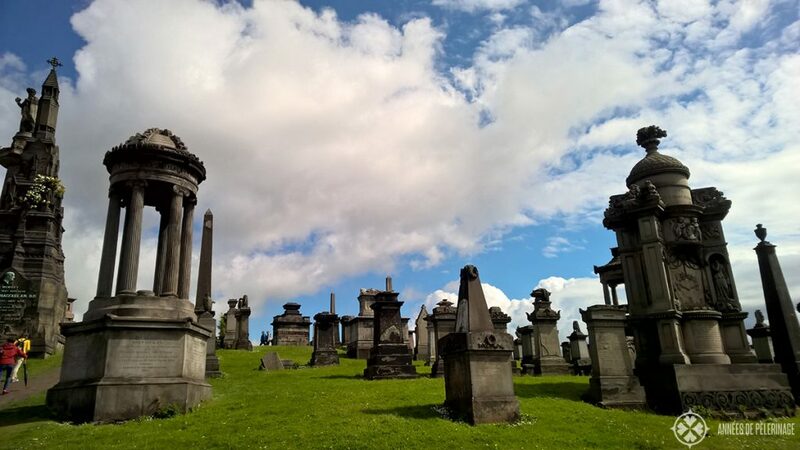 Pro tip: Visit the necropolis. In my opinion, one of the most beautiful graveyards on this planet! Okay, please don’t actually feed the cows. They are quite happy with the juicy grass they find on the Scottish meadows. 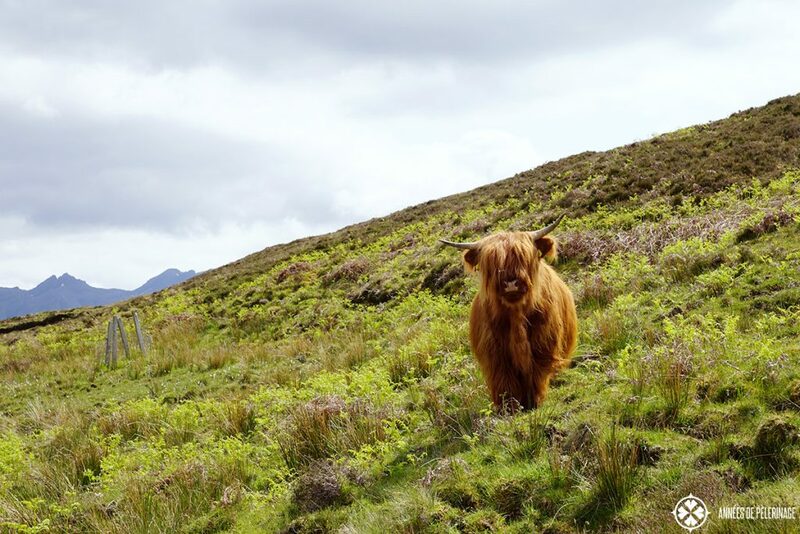 Still, seeing one of the fuzzy highland cows should really be on your list of things to see in Scottland. Just be prepared that you will not be the first (and certainly not the last) to take a picture of them. Ben Nevis is the highest mountain in the British Isles. If you grew up in the mountains, as I did, it’s height. of 1,345 meters will not really impress you. Still, it is quite a beautiful hike. Truth be told, you can choose any other hike as well. But really put hiking one of the Munros (as mountains over 3,000 feet are called) on your list of free things to do in Scottland. 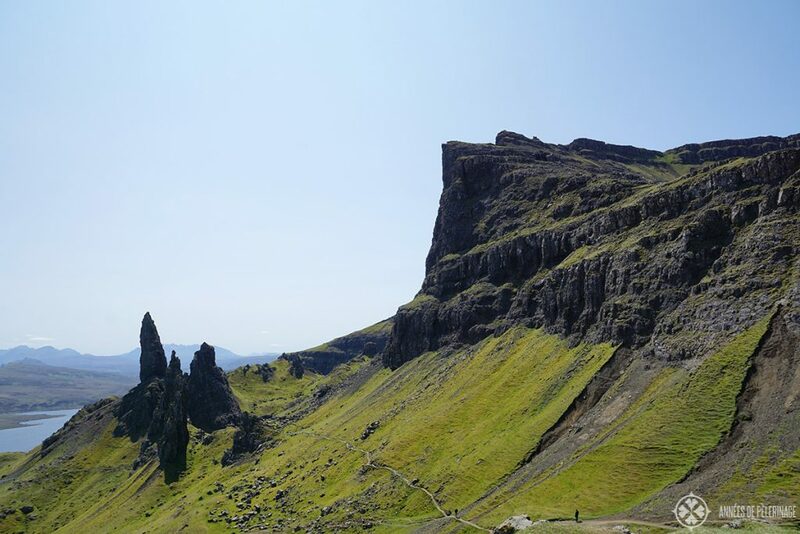 Pro tip: The most beautiful hikes can be found on the Isle of Skye. Like the Old Man of Storr (picture above) or the Quiraing. If you want to experience the real Scotland, a Scotland where Scottish Gaelic is still spoken, then you have to visit the Outer Hebrides. They are a wonderful place for bird watchers and everyone else who likes to enjoy the quiet side of life! The weather can be a bit rough at times, but if you allow it, the beautiful nature will speak to your soul. Last but not least, you have to visit Loch Ness. I was quite reluctant to put it on this list of things to do in Scotland. I hated every bit of Loch Ness. Urquhart Castle is one big touristic mess (and one of the least beautiful castles in Scotland to begin with), there are souvenir booths all over the place and just so many tourist buses. 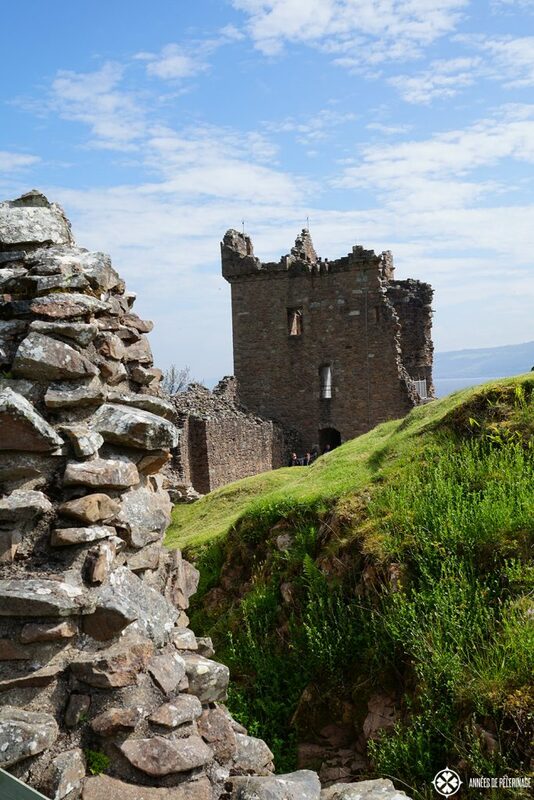 If you want to catch a glimpse of the Nessie legend, I am sure you might consider stopping for a couple of minutes, but there are more beautiful places to see in Scotland and I hope this list was able to convince you! 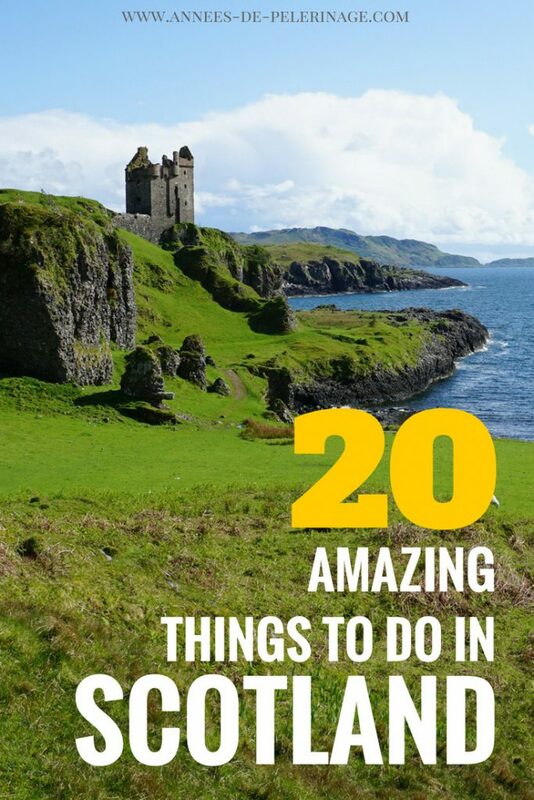 I kept this list to 20 top things to do in Scotland, as most people only have a limited amount of time available for their travels. Still, do not forget the Scottish highlands and the lowlands of Scotland. There are an even couple of amazing UNESCO World Heritage sites around the border to England: The New Lanark mills and the Antoine Wall built by the Romans to keep the Highlanders at bay! 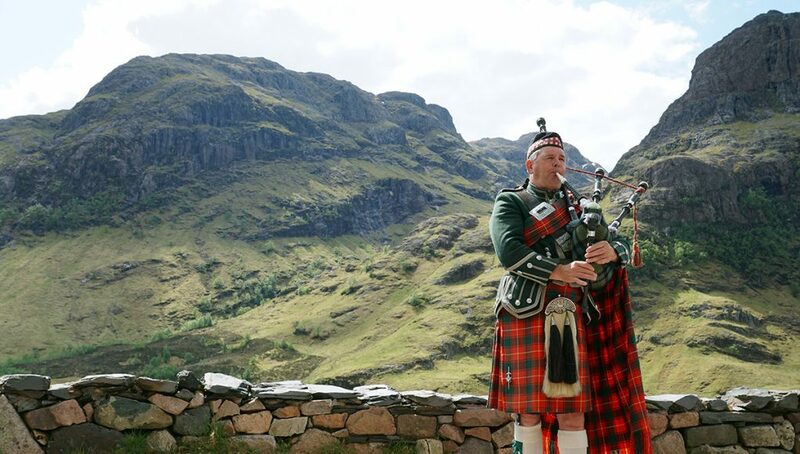 Scotland is also the ideal place for any sort of outdoor sports. Hiking, rafting, even dog sledding is possible and you should absolutely plan to experience that side of this beautiful country. There are also quite a lot of national parks in Scotland. Loch Lomond probably being the most popular one as it’s so close to Edinburgh, but do not discount the others. Oh, and one last word about the weather. Scotland is notorious for lots of rain, fog, and a generally damp climate. If you visit during the summertime, things should be totally okay. From my experience, a little rain helps to increase the saturation of the grass. As for the fog. Truth be told, those castles are not even half as eerie in the sunshine as they are hiding behind an avalonic veil! So no matter the weather, I am sure you will be able to enjoy Scotland. No worries Nicole. Germany is hm…I really haven’t seen all that much in Germany. I mean, I have been to all the larger cities, but whatever is in between is one giant blank spot on my travel spot. Is the veil (for women) allowed in your country? as in most European countries, you are free to wear whatever you want. A full Niqab, however, is forbidden in certain circumstances (like driving a car, or at the customs, or in front of court). Hey, really awesome post! Really well written, and great info – I am planning a trip back here in October, such an amazing country!! Just a wee correction on the Jacobite that it’s actually Fort William-Mallaig ? Just from the pictures you provided, I can believe that there’s virtually no ugly spots in Scotland. My husband wants to go there on our next vacation. It sounds like a wonderful place to go site seeing. Nice list. I have to disagree about Urquhart Castle though. It’s a great place to visit! The history of it and the reason it’s in the condition it’s in makes it very interesting. A visit there on a sunny day is rather spectacular. I’m not sure what you mean about souvineer booths all over the place. When I was there, the only souvineers were in the visitors’ center. it certainly is an interesting place – but it’s not like the other castles don’t have a history, eh? And well, the vistor center is bigger than the castle itself – or at least felt that way to me. Still a nice place – which is why it is on this list. I am from India and i am planning a trip to Scotland. How many days should i keep in hand for a good experience in Scotland? And all the spots mentioned here, can it be done on a roadtrip or will i have to take a flight? please understand that I am no travel agent. I cannot help you plan your itinerary. That being said, a road trip really is your only viable option.